Yesterday, we shared a link to an interview of pro-choice feminist Naomi Wolf defending Feminists for Life in a conversation with pro-life anti-feminist radio host Steven Crowder on his show, Louder with Crowder. Naomi’s support of our mission, despite our disagreement on abortion, proves once again that Feminists for Life of America can uniquely and effectively redirect a contentious debate toward woman-centered solutions. And now, a pop quiz: What does FFL President Serrin Foster have in common with these four men? Politico notes how each of these people, including Serrin, has been interviewed by former Gov. Mike Huckabee on his hugely popular show Huckabee on TBN. 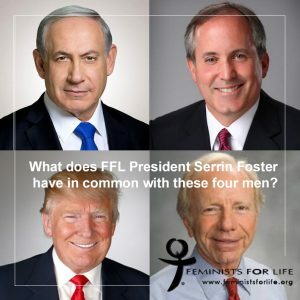 Serrin may never have held office (FFL is nonpartisan, after all! ), but that Politico would list her alongside such prominent figures is evidence that FFL is reaching people on both sides of the aisle. P.S. We ask for your careful consideration of what you feel able to contribute. We hope you will start or increase your monthly support, perhaps by $5, $10, or $25. Your new or increased gift will be double-matched by a small group of donors who want Feminists for Life to have year-round support. So for example, an extra $25 would mean an extra $50 for FFL. We know that you have strategically given. We have strategically invested your hard-earned dollars. Taking advantage of this double-match doubles your impact. If you prefer, we would be grateful for a one-time additional gift. Either way, we encourage you to make a gift at a level that is meaningful to you, and those we serve. We have a very exciting agenda for 2018, but what we want to do can only become what we can do because of your sacrifice for the most vulnerable. Please, make your tax-deductible gift now. Thank you.